If you thought there was something shifty about some of the critters in the Lorwyn and Morningtide set, you would be right . . . there is. Specifically, the 20 Shapeshifters and half-dozen tribal instants. Lets have a look . . Can you spot the Shapeshifter ? Here there is a Faerie, Kithkin, Flamekin, Elf, Merfolk, Goblin, Giant and a Treefolk (in the shadows). The Shapeshifter can actually be anyone of these Lorwyn Block buddies as the changeling is 'every creature type at all times'. This also means that Goatnapper can steal a 'goat', a Boldwry Intimidator may intimidate a 'coward', and anything that would affect an Elemental would also affect a Shapeshifter...you get the idea. The Shapeshifters can come in a variety of sizes and colours to suit your deck and can even lend a helping hand - - Just ask a Harbinger to bring one out to play. Here we see an interesting combination when Leaf-Crown Elder picked up a Runed Stalactite and became every creature type. You can now play every creature type for free and save your mana (use the accent that the ING dude uses). Alternatively, you could use a Shapeshifter to crush your enemies, see them driven before you, and to hear the lamentation of their women as shown by this interesting combination. Just equip Moonglove Changeling with Thornbite Staff and start dealing a point of devastating deathtouch to a creature in your opponent's stable. Just remember, Shapeshifts can really help you deck out and provides a kind of glue to Lorwyn's eight races. In other news, it looks like 'Rhys The Exiled' has returned in Shadowmoor as 'Rhys The Redeemed' . . . this time, it looks like he brought some friends with him. 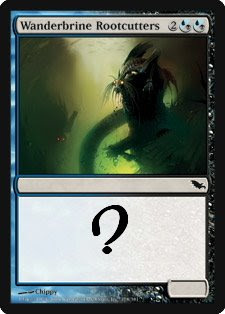 As cards will start to preview on the 31st at WoTC, I have just one more Shadowmoor spoiler post before I get back to business on the Lorwyn block. We've been treated to new Shadowmoor Wallpaper which provides several more tasty spoiler tidbits for the upcoming set. A total of fiver critters have been presented on the wallpaper. They include Ashenmoor Gouger, Faerie Macabre, Grief Tyrant, Murderous Redcap, and Reaper King. The (mana) colour for these creatures are still quite debateable. Details on the 'The Reaper King' have been spoiled for some time now . . . The anticipated mechanic on this is 'harvest' - a very dark twist on the 'Champion' mechanic of Lorwyn and Morningtide. Instead of getting your "championed" creature back when the Champion creature leaves play, you have to sacrifice it. Happy & Safe Gaming ! 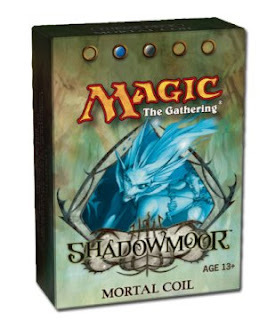 I did want to generate a post on Lorwyn and Morningtide changelings today but Wizards decided to put up the much-anticipated Shadowmoor mini-Site. So I have decided a change in course and will devote one more post to discuss what we may expect for this set's release on May 2nd, 2008. First off however, let us have a look at what the 'Orb of Insight' has been generating for curious. The Orb application, hosted on the Wizards site, allows the user to type in a word (or number). The Orb then informs you how many times that word appears on (each of the 301) Shadowmoor set of cards. Although you are able to enter numbers and mana abbreviations to try and figure out mana costs and activation costs (including hybrid mana), the Orb does not does not count flavor text. To this end, the spoiler nutters over at MTG Salvation and other sites have generated some interesting numbers. Please note that if a keyed-in word appears twice on a card, the Orb will of course provide a count on both those words. There is also a handful of of other critters including Dragons, Wurms, Trolls, including a Demon and an Angel. There also appears to be allowances for mages and even an assassin in this mix. There is an anticipated return of first and perhaps double strike. Some notes . . . It appears that Shapeshifters were not invited to the Shadowmoor party - or at least all of them except one. It also appears that since the Shadow of the Aurora has now blocked out the sun, the Lorwyn and Morningtide Treefolk are going the way of the Dodo bird. In their place however are 'Scarecrows'. 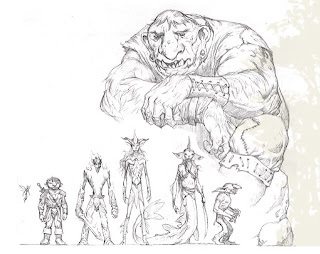 From the artwork, I will guess that these new entities are the magical constructs of goblins . . . who would have guess - - Treefolk and Boggarts in cahoots ! 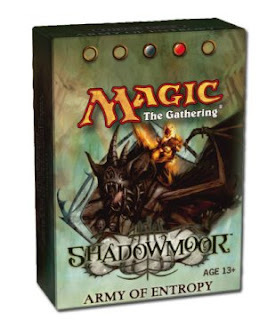 With the next set, Shadowmoor due to be released May 2, 2008, I have been giving some thought to the pre-constructed decks we could expect. For those blog readers who have an interest in the expected Shadowmoor Theme Decks, this post is for you. Expect Flamekin (Elementals) and Demons in this theme deck. Given the image of the Flamekin riding a huge honking bat-like critter, I am left to wonder if there is an asbestos saddle involved . . .
Expect a showing of Kithkin in here. Will there be a return of Angels ? The image on the packaging certainly suggests purity with wings. Expect Faeries and Merfolk in this deck. 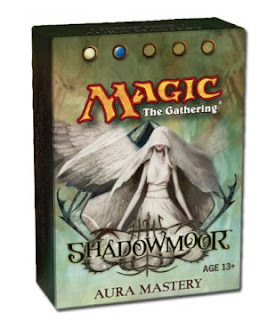 I think that this will be the first Shadowmoor pre-constructed I buy . . . Just because the Merfolk look so bad-a$$ and not based upon any informed speculation of what card yumminess this deck may contain. German for Landslide (or big change ?) What the final English name may be quite different in meaning from the German. 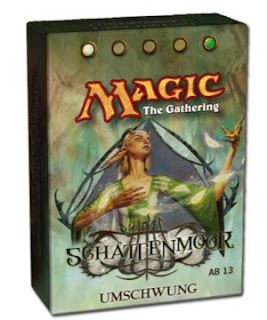 Just like the packaging spells it out, Expect Elves in this theme deck. German phrase for "too much of a good thing" (?). I do not expect that the English name will be anything like this. Expect forests and other big aggressive monsters. 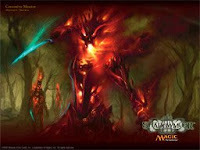 Wizards officially posted the Shadowmoor Theme Decks today in Magic Arcana. The above post from the 19th generated a lot of speculative banter on the forums. 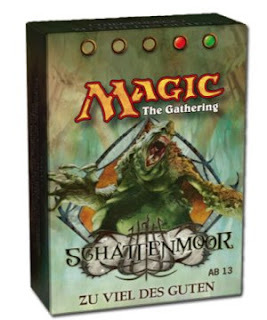 I imagine that the European retailer which leaked the theme deck images may have received a phone call from WoTC by now. Aura Mastery (White/Blue) - Unleash the power of enchantments. Buff up your creatures, put the whammy on your opponent's, and then snap your fingers to scramble Auras around at your whim. Your enemies will grudgingly applaud even as their plans are ruined. Mortal Coil (Blue/Black) - Mortality is annoying, but these creatures don't mind. The persist mechanic allows them to laugh in the face of death, or even benefit from dying. You'll weave combos and frustrate your opponent as your minions repeatedly jump back to play. Army of Entropy (Black/Red) - Things wither and die. That's a fact of life, especially in Shadowmoor. But don't stop that entropic cycle of nature—accelerate it! Tear down defenses and leave permanent scars in your foe’s life total. Your smoldering warriors will own an empty board. Overkill (Red/Green) - Go for the big finish. Buy time with an innocuous army while you build to a game-winning mystic explosion. Demolish the board with a cataclysmic spell that will set records every time you play the deck. Mages are measured by the spells they wield, so why not wield the biggest ones? Turnabout (White/Green) - They'll never see it coming. Your tricky creatures can untap at a whim to create combat superiority or machine-gun combos. Use their untap abilities repeatedly to build up immense creatures or swarms of tokens—and leave your opponents wondering what hit them. 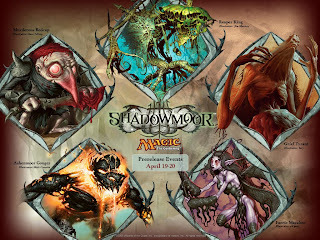 I was hoping to get back to my continuing exploration and examination of Lorwyn / Morningtide but it appears that the next Expansion set of Shadowmoor is an itch I will have to continue to scratch. To this end, today's post showcases some of the absolutely stunning artwork Wizards of the Coast is providing with the new set. As expected, Shadowmoor is a dark Lorwyn of sorts, an environment in perpetual twilight with only the elves clinging on to the last rays of beauty and light. Speaking of Elves, lets start with one . . Most likely an instant or other sorcery perhaps. Very little change from the Lorwywn block Elves we have all come to love (or hate). The Elves may be provided with some divine assistance perhaps as the Shadowmoor card 'Beseech the Queen' suggests. The mana symbols on Beseech the Queen are three half 2 Mana and half 1 Black Mana. Mark Rosewater addressed this is a new twist on hybrid in a recent article. Apparently, the converted mana cost is 6. The new Shadowmoor Merfork lurking in the wanderbrine look decidedly more vicious however. I should think twice about taking a dip in any merrow now. There is a suggestion with Wanderbrine Rootcutters that the merrows may have flooded past the confines of their banks and now threaten Shadowmoor forests. Think of a saline soaked mangrove but with dangerous swimming critters. The comical accident-prone Lorwyn boggarts (goblins) also appear to evolved significantly. No more fish-bricks . . .
Kithkin kitchens in Kinsbaile, Burrenton, Goldmeadow, and Cloverdell are now no longer safe. The Shdowmoor boggarts now may also perhaps pose a threat beyond clachans. Treefolk and other combustible creatures take note of Boggart Arsonists. Perhaps the Kithkin do not have any great cause to fear for the safety of their kitchens given their new war-like appearance. A Kithkin Rogue such as Ballynock Chohort would surely clean the place up. Shadowmoor critters may be well served to stock up on a LOT of Raid ® Outdoor Demon-cide with the threat posed by by Demigod of Revenge. Artifact creatures may be making a return to Magic: The Gathering. Lurebound Scarecrow looks like the stuff nightmares are constructed of. Kithkin kids beware . . . do not accept candy (or dolls) from strangers or strange things. Until next time, play safe . . . always use card sleeves. Today, Judge Hugh Bennett, residing over the divorce settlement case involving Paul McCartney and nutcase Heather Mills delivered final judgement. In other more interesting news, Wizards of the Coast officially announced the next expansion block (code named 'Rock', 'Paper', 'Scissors') on Magic Arcana. From leaked documents, specifically a image from "A Planeswalker's Guide to Rock" (as shown below), it appears that the new set will contain planeswalkers, mages, assassins and a host of other interesting characters including 'commoners'. May the Spoilers Begin ! In Magic: The Gathering, Artifacts represent magical items, animated constructs, pieces of equipment, or other objects and devices. In previous sets, Artifacts were often inanimate creatures, sometimes a land, and once even a fortification. Like enchantments, artifacts remain in play until something removes them. Artifacts are distinct from other cards in that they are colorless, and can be played using any color or colours of mana. Only once do I recall an artifact card requiring 2 colourless and one blue mana. 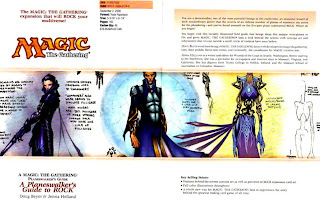 Recently (OK, a few short years ago), Wizards of the Coast introduced Equipment Artifacts. Equipment has carried over to the Morningtide set in the form of Tribal-themed Equipment. These Equipment cards enter play just like other Artifacts and may be attached or equipped to a player's creature to provide the stated effect. Should the creature be slayed (may your Deity forbid it) during the course of the game, the equipment still remains in play and may be equipped to another creature. We are presented with 12 Lorwyn-set Artifacts consisting of 7 rares and 5 commons. Of this bunch, only two are equipment. As for the Morningtide set, there are 6 Artifacts containing 1 rare and 5 uncommons. Of this, 5 are equipment cards. 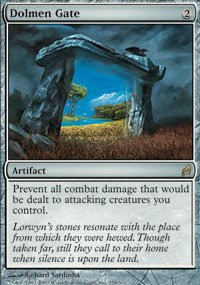 The flavour and theme of the Lorwyn block are again echoed within Artifacts. There are 5 Artifact Equipment cards for each of the five classes offered; Soldiers (Kithkin, Giant, Treefolk, Merfolk, Faerie), Shamans (Elemental Flamekin, Treefolk, Goblin, Elf), Wizards (Giant, Elemental, Merfolk, Faerie, Kithkin), Warriors (Giant, Goblin, Treefolk, Elemental Flamekin, Elf), and Rogues (Goblin, Merfolk, Kithkin, Faerie, Elf) within Lorwyn. The common text within these cards read "Whenever a (stated Class) creature comes into play, you may attach (stated Artifact Equipment) to it". Furthermore, a mana cost is provided to equip the given artifact to the creature which varies from card to card, but expect to pay 2 to 4 mana. Whatever type of deck you have decided to build, chances are that there is a spot for an artifact which may play an integral part to that deck's success. Personally, I have had some limited success with the inclusion of several Springleaf Drums in my Merfolk Milling Deck to satisfy my tap-happy fish. I have also provided a pair of Door of Destinies in another aggro deck to enhance what my tokens may swing for. For an engaging article stuffed with Artifact yumminess, drop by WOTC and read Mark Rosewater's article. which can be paid with one of two colors. Already, the resourceful Magic Community is hard at work in the forums developing speculations for the new Shadowmoor set. There is a very decent summary of the speculation discussions to be found at 'The Fugitive Wizard's' Blog which has been summarised here for your convenience. Please remember - these are still just speculations. Sickle Ripper - 1B. Creature-Elemental Shaman. 2/1. Loamdragger Giant - 4(G/R),(G/R),(G/R). Creature-Giant Warrior. When Loamdragger Giant CIP, you may return up to two target lands from your graveyard to your hand. 6/6. Torpor Dust - 2(U/B). Instant. Destroy target Non-Faerie creature. Boggart Arsonists - 2R. Possibly a Creature-Goblin. 2R, Sacrifice Boggart Arsonists: Boggart Arsonists does 3 damage to target creature or player. 2/2. Scar - (R/B). Instant. Put 2 -1/-1 counters on target creature. Turn to Mist - 1(W/U). Instant. Prevent all combat damage that would be dealt to and dealt by target creature this turn. Blistering Dieflyn - 3R. Creature-Elemental. When Blistering Dieflyn becomes blocked, it deals 2 damage to each creature blocking it. 2/2. Beseech the Queen - (2/B), (2/B), (2/B) - Sorcery. 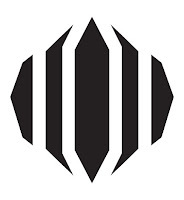 This appears to be another new mana symbol. It looks like that the symbol '2/B' may give you the option to pay 1 Black or 2 colorless mana. 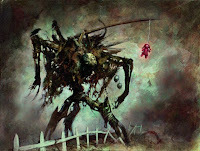 Lurebound Scarecrow - 3. Artifact Creature-Construct. Lurebound Scarecrow must attack each turn, if able. Wilt-Leaf Cavaliers - (G/W),(G/W),(G/W). Creature-Elf Warrior. First Strike. Vigilance. 4/4. 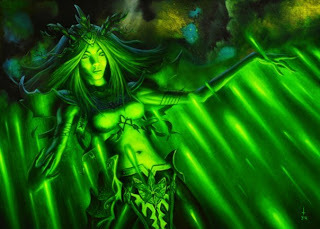 Demigod of Revenge - (B/R), (B/R), (B/R), (B/R), (B/R). Creature-Demon Wizard. Flying, Trample. Whenever a creature deals damage to Demigod of Revenge, destroy that creature at end of combat. 5/5. As there are 451 magic cards in the Lorwyn block, one would be able to play a multitude of different types of decks constructed around mana colour, card combinations, creature race, or class. Most Magic players enjoy constructing a deck just as much as playing the deck itself. Control Deck - This type of deck contains cards intended to control or interupt your opponents play by a variety of methods such as creature removal or counterspells. The strategy with this sort of deck is restrict your opponent from ever gaining an upper hand and then to produce one or more cards or card combinations to win the game. Aggro Deck - The name for this deck type is a diminutive for 'aggresive'. As the name suggests, the cards within this deck has been included to deliver the most amount of damage possible. An Aggro deck would typically contain a large amount of creatures which can overwhelm blockers early in the game and begin dealing damage directly to the opponent before they would be able to mount a resistance. Combo Deck - As you may have guessed, this type of deck uses a combination of cards chosen to deal a large amount of damage to an opponents, often in just a limited number of turns. To be able to bring out the strategic combination of cards quicker, the player often includes cards which allow them to search their library for them. The Lorwyn block provides eight such cards called 'Harbingers'. As a singular blog post is insufficient to even attempt to provide exiguous examples of Lorwyn block constructed deck types, I will resign myself to suggesting cards which may lend itself well to these decks. Control Example: Some colours naturally lend themselves naturally to certain deck types. Blue has traditionally seen itself being considered for inclusion in control-type decks. There are several white and blue Merfolk cards which may be candidates for inclusion in a control deck. One strategy is to 'mill' (from the older Magic card 'Millstone') until all their cards are removed thus winning the game. Some cards to consider here are Drowner of Secrets, Ink Dissolver, Grimoire Thief, and / or Jace Beleren. Aggro Example: If you are looking to overwhelm an opponent, there are many cards available which crank out a multitude of tokens which will take care of business. 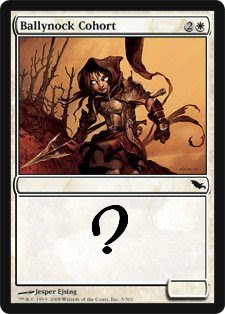 Cards such as Lys Alana Huntmaster, or Elvish Promenade may be considered for this task. 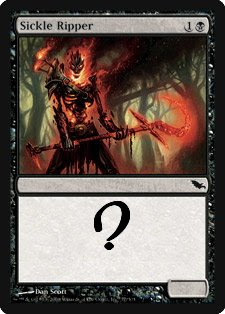 Alternatively, a player may decide to deliver massive hits and include cards with 'trample' which are able to deal damage to their opponent even when blocked. Some examples may include Nova Chaser or Boldwyr Heavyweights. Combo Example: Some players build a deck around one or two very effective card combinations. Given the size of the Lorwyn Block one can imagine the great number of combinations available. These range from from fairly simple and effective combinations such as coupling Kinsbaile Borderguard and Graceful Reprieve to more complex ones requiring two or more. Another example of a simple and effective combo is Militia's Pride and Dolmen Gate. Remember, the deck you decide to build is bounded only by your imagination.